Our knees are put through a daily stress test as we use them to walk, run, sit, stand, balance, bend, stretch, squat, drive, and move. The older we get, the weaker (and noisier) our knees become, and we miss the days of our youth when took our knees and health for granted. Knee pain can occur at any age, and often happens due to a fall, or sports injury. One of the most common injuries to the knee is a sprain or tear to the anterior cruciate ligament, also known as ACL. The knee joint is comprised of the meeting of three bones, the thighbone, shinbone, and kneecap, which is in the front of the joint for protection. This is what you can immediately feel when placing a hand on the knee. Bones are connected to each other by ligaments, of which there are four in the knee, two collateral, and two cruciate. Collateral ligaments are on either side of the knee, with the medial collateral on the inside, and the lateral collateral on the outside. These ligaments help brace the knee and control the side to side motions it can produce. The cruciate ligaments are located behind the patella and together they cross behind the patella forming the letter “X”. The anterior cruciate is in the front, and the posterior cruciate is in the back. These ligaments control bending, and back and forth movements of the knee. 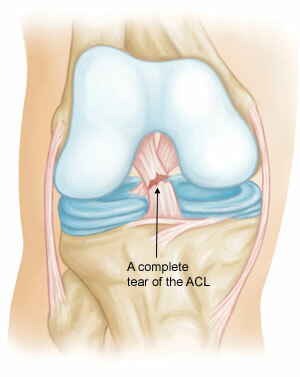 During sports and high impact activities, the location of the ACL makes it a prime target for sprains or tears. Injuries can occur from changing direction too quickly, such as in basketball or tennis, a direct hit in football, landing wrong from a jump, or other sudden movements. A typical symptoms of an ACL injury is a popping sound of the knee, and it giving out. Pain and swelling, loss of motion, and pain are typical responses. ACL injuries are graded from 1 to 3, with 1 being a mild sprain, 2 is a partial tear (which are actually rare), and 3 is a tear of the ligament. An ACL tear cannot heal on its own, and while most injuries require ACL reconstruction, some nonsurgical treatments can be helpful for those who are elderly or lead a sedentary life. Braces, and physical therapy are common treatments for those having tears, with or without surgery. 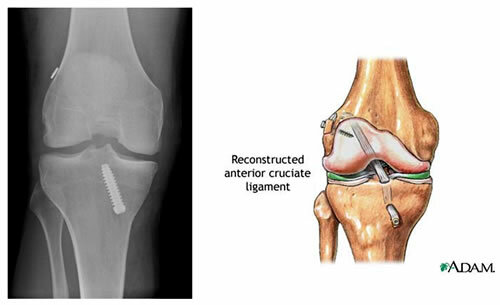 Those that require ACL reconstruction will undergo arthroscopy in order to assess the damage and repair it. Grafting is the typical surgical procedure for those with a torn ACL, and the replacement tendon comes from the patient himself. 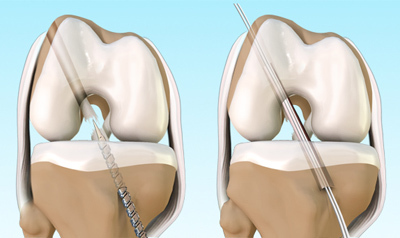 The success rates for surgical ACL reconstruction are a very high 82 to 95%. The graft and repair of the ligament gives the knee stability, and allows the patient to return to activities they had done prior to the injury. Patients whose life style includes activities that require turning and twisting of the knee, or manual labor are good candidates for the surgery. While there are always risks associated with surgery, the outcome is favorable. If you have sustained a knee injury or have been told that you are in need of an ACL reconstruction, contact our nationally recognized sports medicine specialists at Orthopedic Surgery San Diego for an evaluation today.